The IEA website is constantly being revised and updated. A major revision occurred over the course of 2017, with the additon of numerous bilateral agreements and a wholescale updating of membership actions for all MEAs and a large number of BEAs. Current content includes over 1,300 MEAs, over 2,200 BEAs, 250 other environmental agreements, and over 90,000 individual country "membership actions" (dates of signature, ratification, or entry into force; release notes here). A major thanks to Jorg Balsiger and Lorris Germann of the University of Geneva who identified over 650 BEAs and have provided the foundation for the IEADB to become a comprehensive list of both bilateral and multilateral environmental agreements. A list of BEAs by decade is available here. The IEADB Project established a Board of Contributors in early 2017; international scholars committed to helping develop, maintain, and improve the IEADB database and research platform. Find out more here. New user of the IEADB? Try the QuickStart Guide to Using the IEADB. Lists of international environmental treaties, conventions, and other agreements with links to text, membership, performance data, secretariat, and summary statistics. Over 1300 multilaterals, 2200 bilaterals, and 250 "other". Grouped by Date, Subject, and "Lineage" of legally-related agreements (e.g., those related to the Montreal Protocol). "Other" includes environmental agreements between governments and international organizations or non-state actors, rather than 2 or more governments. NEW: Membership links in agreement lists now provide year-by-year status reports, and the same information in Stata format for data analysis. 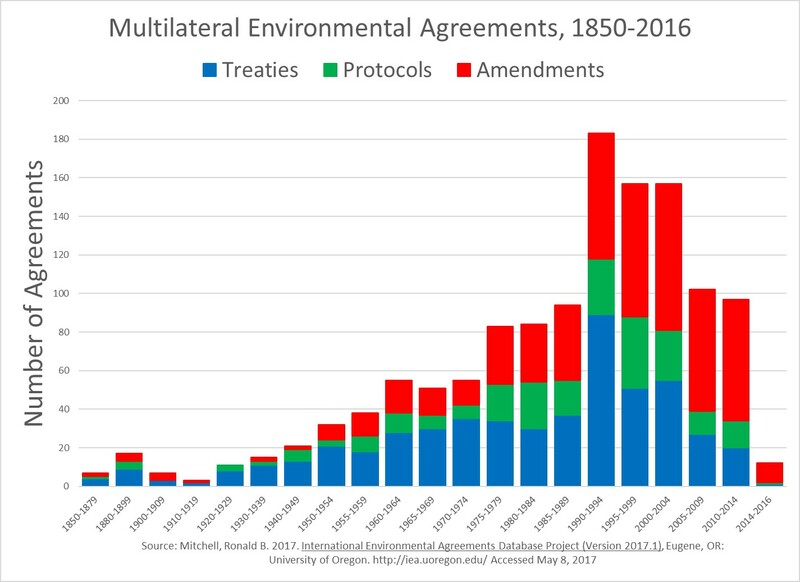 How many Multilateral Environmental Agreements have been signed? Data or Graph of agreements by year and type (treaty, protocol, amendment). Datasets of over 150 environmental indicators (from secretariats or scholars) linked to the IEAs trying to improve them, for use in assessing the influence/effectiveness of IEAs, e.g., whale harvest (1910-2005); acid rain emissions (1980-2005); and emissions of ozone depleting substances (1986-2005). Use the Performance Data link or the "Data" links in each Agreement list. Linked Treaty Datasets and Data ArchivesThe IEA Project began in Fall 2011, to provide a means to archive datasets related to environmental treaties that can no longer be readily housed elsewhere.